Although this procedure can be effective, it should be avoided in eyes with certain characteristics. • PPV with ILM peeling can be an effective alternative for treatment of DME in patients with poor response to antiangiogenic therapy. • In the study described here, as in other series, a decrease in macular edema was observed in most patients after PPV with ILM peeling. • Eyes with certain characteristics should not undergo vitrectomy with ILM peeling, as foveal atrophy and visual deterioration may result. In 1992, Lewis and colleagues were the first to describe peeling of the posterior hyaloid, with resulting improvement in visual acuity and resolution of macular edema.5 Gandorfer6, Ikeda7, and La Heiji8 and their colleagues demonstrated that vitrectomy effectively resolved macular edema in eyes without vitreomacular traction. The necessity of internal limiting membrane (ILM) peeling is still unclear. It has been reported that a posterior precortical vitreous pocket exists anterior to the posterior retina, possibly extending to the temporal vascular arcades.9 The posterior surface of this pocket is attached to the ILM, so that, after a posterior vitreous detachment is induced during vitrectomy, only the anterior surface of the pocket is removed, leaving the posterior surface in situ. The posterior surface can then continue exerting tractional forces upon the retinal surface. The greater structural improvement that has been described after ILM peeling may result from the additional removal of residual vitreous cortex after the initial surgical posterior vitreous separation. This was suggested by a study showing that, after surgical posterior vitreous separation, residual vitreous cortex was still seen.10 The residual vitreous cortex may contribute to continued exertion of tractional forces upon the macula and consequent development of edema. In recent years, numerous studies have shown that pars plana vitrectomy (PPV) can be beneficial in diffuse DME with and without a thickened and taut posterior hyaloid.11,12 Larger case series and longer follow-up periods might be needed to further explore these results. We evaluated the results of PPV with peeling of the ILM for treatment of persistent, clinically significant macular edema (CSME) in patients previously treated with laser and/or antiangiogenic agents. Our study was carried out with the approval of institutional review boards at Fundacion Hospital Nuestra Señora de la Luz in Mexico City, Mexico. This longitudinal, prospective study was performed between June 2014 and October 2015, and all patients had at least 14 months’ follow-up. Informed consent was obtained from each patient prior to his or her inclusion in the study. The inclusion criteria for this study were as follows: patients with a diagnosis of diabetes mellitus type 1 or 2, with CSME with no treatment for the previous 3 months, with central macular thickness (CMT) greater than 300 µm. Each patient had at least three applications of an antiangiogenic agent: bevacizumab (Avastin, Genentech) and/or ranibizumab (Lucentis, Genentech). Eyes with vitreous traction and macular edema demonstrated on spectral-domain optical coherence tomography (OCT) were excluded, as were patients with cataract and other eye diseases. Patients included in the study had undergone treatment for DME with antiangiogenic agents and/or laser without improvement. All patients underwent PPV with peeling of the ILM. Patients were evaluated on a monthly basis, with examinations including BCVA, refraction, biomicroscopy, indirect ophthalmoscopy, and intraocular pressure measurement. Retinal tomography was performed with the Spectralis HRA + OCT (Heidelberg Engineering) platform, software version 5.6, using the dense scan pattern. CMT was evaluated at baseline, at 3 months postoperative, and at the last follow-up visit of the study period. At 3 months postoperative, bevacizumab could be given as rescue therapy if persistence of DME was demonstrated by OCT and visual acuity measurement. All PPVs were performed by the same surgeon using a conventional vitrectomy technique. Three 23-gauge ports were created. Intermediate and posterior vitrectomy was carried out. Trypan blue dye was used for staining to facilitate removal of the hyaloid, and then brilliant blue dye was applied for peeling of the ILM. Surgery was concluded with fluid-air exchange and removal of the trocars. The distribution of the data was analyzed using the Kolmogorov-Smirnov test. Categorical variables were compared using the X2 test with Yates correction or with a Fisher exact test. The distribution of continuous data was analyzed using the Kruskal-Wallis or Mann-Whitney test for comparisons of multiple or paired groups, respectively. 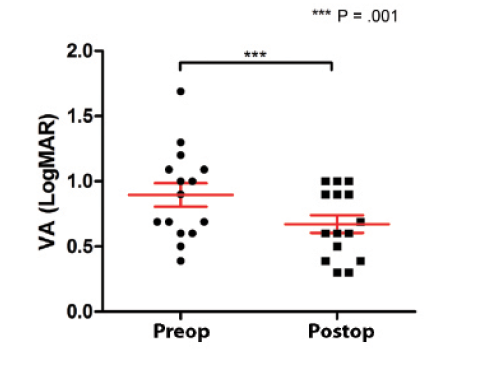 Analysis of pre- and postoperative averages was performed with the Student t test. Fifteen PPV procedures were performed in 14 patients. All included double staining and successful removal of both the hyaloid and the ILM. All surgeries were completed without intraoperative or postoperative complication. The mean BCVA (LogMAR) improved significantly from 0.89 preoperatively to 0.61 postoperatively (P = .0009), corresponding to 20/160 and 20/80 Snellen, respectively. One patient showed a 1 line loss of visual acuity, and 86% of patients gained at least 1 ETDRS line of vision (Figure 1). Figure 1. Visual acuity pre- and postoperatively. Figure 2. CMT pre- and postoperatively. 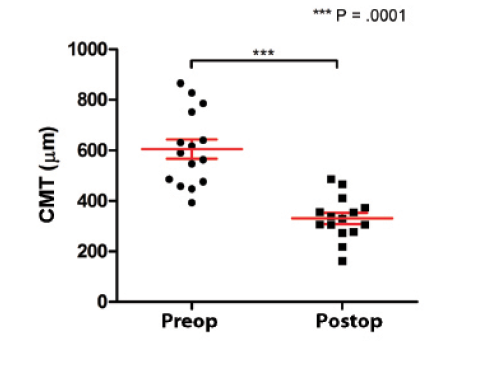 Mean CMT decreased significantly from 650 ±146 µm preoperatively to 331 ±84 µm postoperatively (P = .00011). Mean change in CMT was -274 µm. Three eyes required one round of bevacizumab rescue therapy at 3 months postoperatively. A decrease in CMT was seen in 86% of patients, two were unchanged during follow-up, and none had an increase in thickness (Figure 2). In our series, 86% of patients experienced a gain of vision averaging 1.5 lines. Taking into account these patients’ chronic edema and history of previous treatment, this represents significant improvements in visual acuity. In our study, as in other series, a decrease in macular edema was observed in most patients. 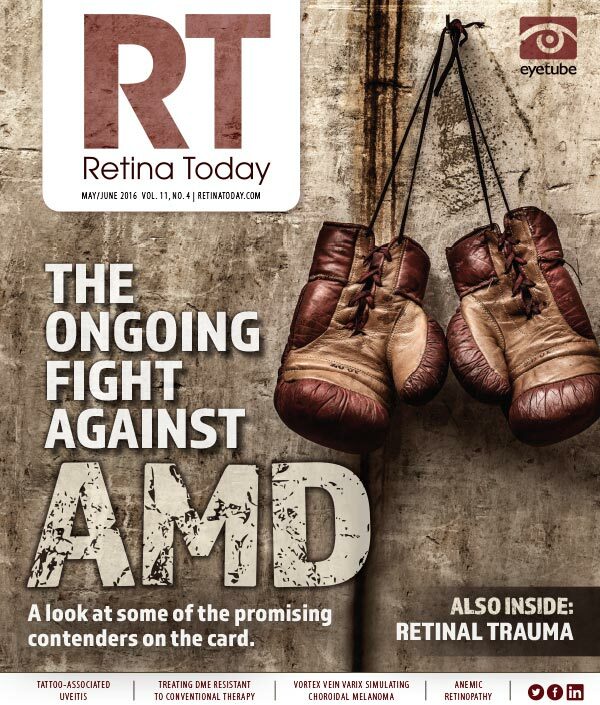 The potential for functional recovery depends on the extent of retinal structural changes and whether or not they are reversible, as well as the extent of nonperfused areas of the retina. 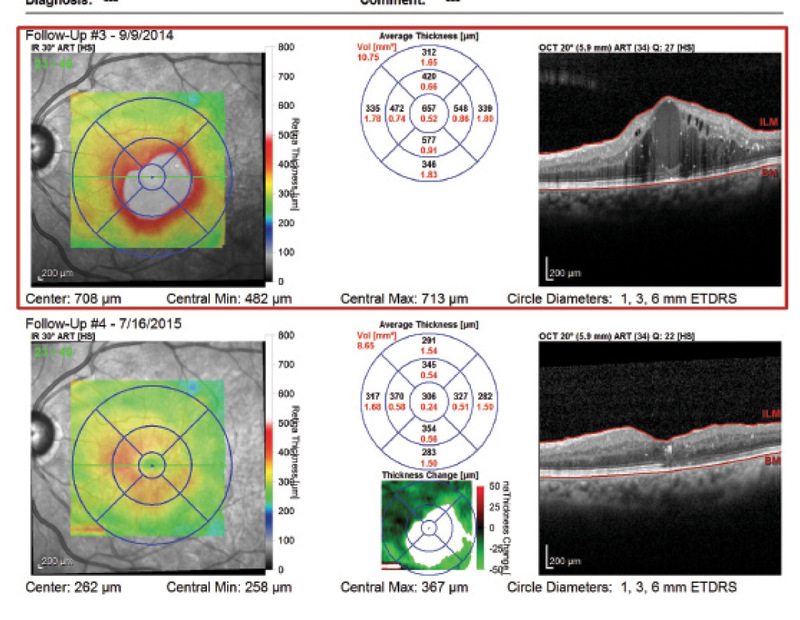 We noted that patients with increased central foveal macular cysts had CMT measurements of at least 500 µm plus a loss of the integrity of the outer retinal layers (external limiting membrane and ellipsoid zone). After surgery in these patients, CMT dramatically decreased and the central macular cysts disappeared; however, there was no improvement in the integrity of the outer layers, indicating subfoveal atrophy. Visual acuity remained stable in these eyes during follow-up, without significant improvement. Romano and colleagues termed this phenomenon the floor effect. In a group of patients undergoing vitrectomy with removal of the ILM, they observed subfoveal atrophy with a lack of outer retinal layers, with no improvement of visual acuity and worsening in some.16 They concluded that patients with foveal cysts larger than 390 µm should not undergo vitrectomy with ILM peeling. In our series, the patient depicted in Figure 3 shared some of these characteristics: CMT of 657 µm and a central cyst of at least 500 µm thickness, but with integrity of outer retinal layers. After surgery and throughout follow-up, the patient had a total reduction of cystic and intraretinal fluid with preservation of the outer retinal layers and a gain of 2 lines of visual acuity (Figure 3). The integrity of the outer layers observed on OCT in this patient provides an indicator of good visual prognosis despite significant edema. Figure 3. Preoperatively (top), this patient had a CMT of 657 μm and a central cyst of at least 500 μm thickness, but with integrity of external lines. After surgery and throughout follow-up (bottom), the patient had a total reduction of cystic and intraretinal fluid with preservation of the external lines and a gain of 2 lines of visual acuity. Based on the results of our study, we believe that PPV with ILM peeling is an effective alternative for treatment of DME in patients with poor response to antiangiogenic therapy. We know that anti-VEGF agents are the gold standard treatment for DME, but they do not have the desired effect in all cases. Therefore, we need to seek alternatives and new treatments that can achieve synergy with existing therapies, not substitute one for another. 1. Meyer CH. Current treatment approaches in diabetic macular edema. Ophthalmologica. 2007;221:118-131. 2. Varma R, Torres M, Peña F, et al; Los Angeles Latino Eye Study Group. Prevalence of diabetic retinopathy in adult Latinos: the Los Angeles Latino eye study. Opthalmology. 2004;111(7):1298-1306. 3. Asociación Mexicana de Retina. Resultados del Día Panamericano de detección de retinopatía diabética (3 de julio de 1999, día D). Rev Mex Oftalmol. 2005;79:88-92. 4. Klein R, Klein BE, Moss SE, et al. The Wisconsin epidemiologic study of diabetic retinopathy. IV. Diabetic macular edema. Ophthalmology. 1984;91(12):1464-1474. 5. Lewis H, Abrams GW, Blumenkranz MS, et al. Vitrectomy for diabetic macular traction and edema associated with posterior hyaloidal traction. Ophthalmology. 1992;99:753-759. 6. Gandorfer A, Rohleder M, Kampik A. Epiretinal pathology of vitreomacular traction syndrome. Br J Ophthalmol. 2002;86(8):902-909. 7. Ikeda T, Sato K, Katano T, Hayashi Y. Vitrectomy for cystoid macular oedema with attached posterior hyaloid membrane in patients with diabetes. Br J Ophthalmol. 1999;83(1):12-14. 8. La Heiji EC, Hendrikse F, Kessels AGH, et al. Vitrectomy results in diabetic macular edema without evident vitreomacular traction. Graefes Arch Clin Exp Ophthalmol. 2001;239(4):264-270. 9. Kishi S, Shimizu K. Posterior precortical vitreous pocket. Arch Ophthalmol. 1990;108(7):979-982. 10. Sonoda KH, Sakamoto T, Enaida H, et al. Residual vitreous cortex after surgical posterior vitreous separation visualized by intravitreous triamcinolone acetonide. Ophthalmology. 2004;111(2):226-230. 11. Rosenblatt BJ, Shah GK, Sharma S, Bakal J. Pars plana vitrectomy with internal limiting membranectomy for refractory diabetic macular edema without a taut posterior hyaloid. Graefes Arch Clin Exp Ophthalmol. 2005;243(1):20-25. 12. Harbour JW, Smiddy WE, Flynn HW Jr, Rubsamen PE. Vitrectomy for diabetic macular edema associated with a thickened and taut posterior hyaloid membrane. Am J Ophthalmol. 1996;121(4):405-413. 13. Dillinger P, Mester U. Vitrectomy with removal of the internal limiting membrane in chronic diabetic macular oedema. Graefes Arch Clin Exp Ophthalmol. 2004;242:630-637. 14. Gandorfer A, Messmer EM, Ulbig MW, Kampik A. Resolution of diabetic macular edema after surgical removal of the posterior hyaloid and the inner limiting membrane. Retina. 2000;20(2):126-233. 15. Yanyali A, Horozoglu F, Celik E, Nohutcu AF. Long-term outcomes of pars plana vitrectomy with internal limiting membrane removal in diabetic macular edema. Retina. 2007;27(5):557-566. 16. Romano MR, Romano V, Vallejo-Garcia JL, et al. Macular hypotrophy after internal limiting membrane removal for diabetic macular edema. Retina. 2014;34(6):1182-1189. • professor of ophthalmology and public health sciences, Penn State Hershey Eye Center, Hershey, Pa.